A line of buses was standing near the War Memorial, ready for starting service. 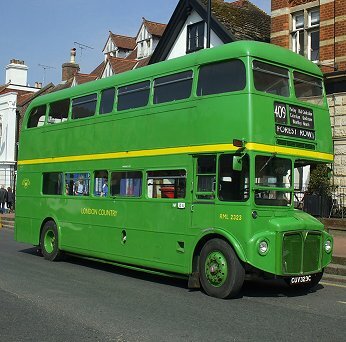 One was Country Bus Rallies stalwart GS2. The Guy Special was set up for the 87, one of the day's featured routes. 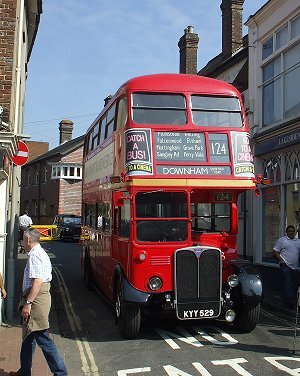 This ran through Southdown territory. 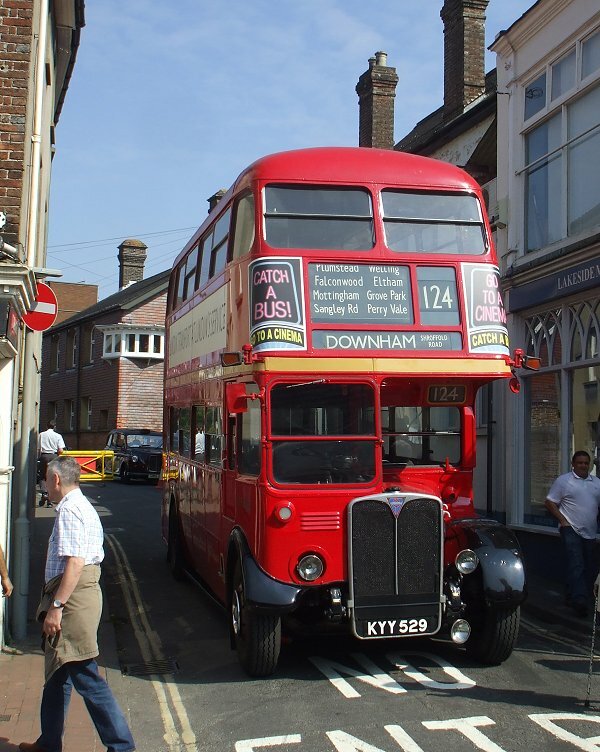 It was one of Sargeant's local routes, taken over by Southdown in the 1950s, and ran the long way round to reach Forest Row. 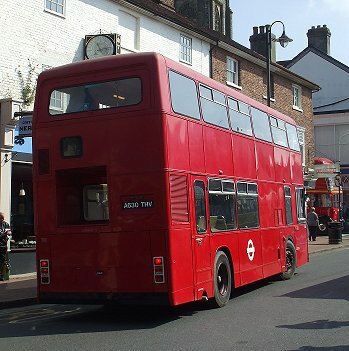 More of this later. 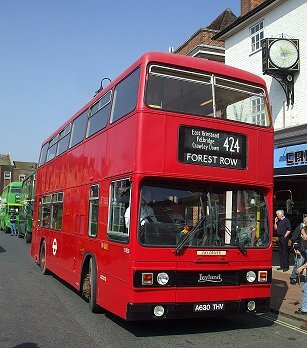 Next in line was RF146, making its first public outing for 14 years. 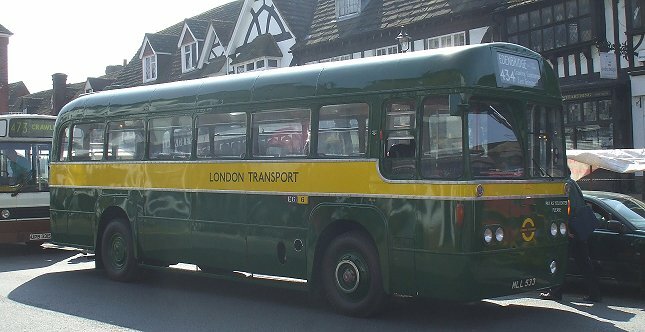 Fresh from overhaul and the paint shop, this modernised RF wears the rare short-lived yellow band London Transport Country Bus livery. Looking, and smelling, immaculate, it was awaiting its first trip on the 434 - also of which more anon. 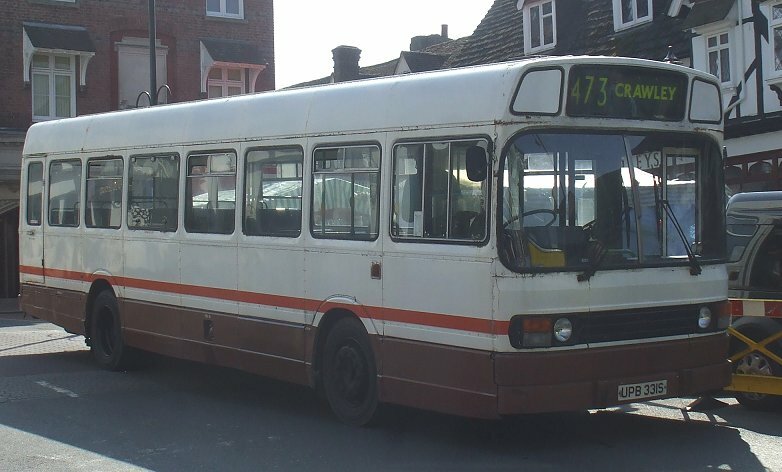 Leyland National SNB331 was waiting to take a 473 to Crawley. Newly into preservation this year, it still wears its previous owner's white livery. It too was making a running day debut. Next a pair of Central Area visitors: Catford's RT1702 occupied the same place as last year, blocking car access to the High Street from the north, and RTW185, with its trade stand, was on the south side of the High Street. 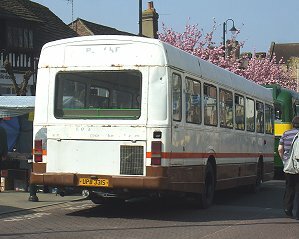 RT1702 was sporting its newly applied advertisements. 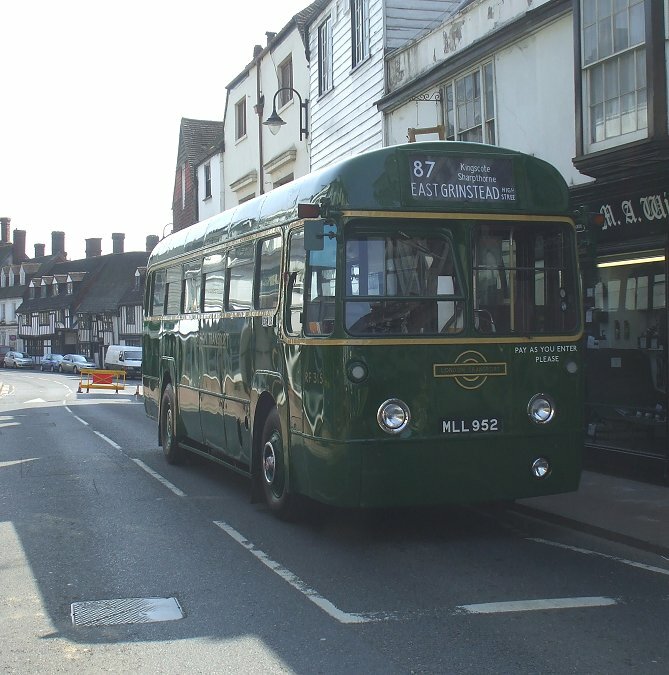 Also standing in the deep shadows of the narrow section of High Street was RF315, also waiting for a turn on the 87. In the sunshine, also heading for Forest Row - but the short 409 way - was RML2323 in the light green and yellow favoured by London Country for a time. Another of the day's featured high-frequency routes was the 424, running between Forest Row and Copthorne, mainly with more modern preserved buses, which are developing their own following, and which mainly need to run outside the Emission Control Zone. 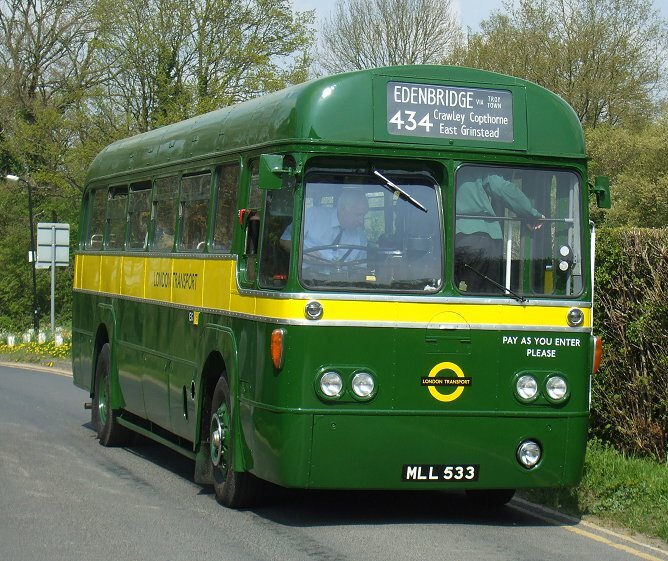 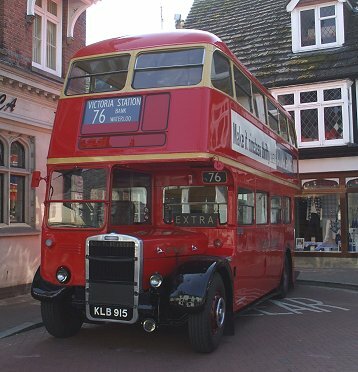 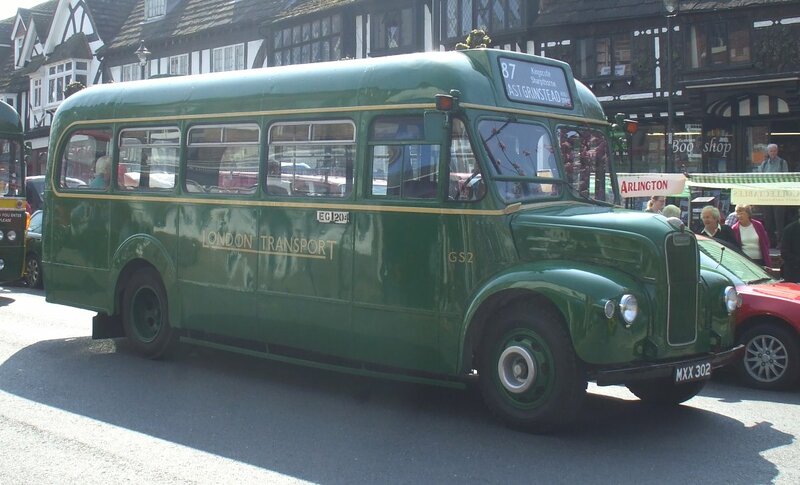 One of Bromley Bus Preservatioin Group's vehicles was T1030, which headed east on the 424.